Kingdom Hearts Final Mix is a Japan reissue of Kingdom Hearts that uses English voice acting with Japanese subtitles among additional in-game features. The PlayStation 2 version of it is exclusive to Japan. 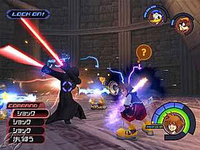 The game was remastered in HD and released as part of Kingdom Hearts HD 1.5 ReMIX for PlayStation 3 on March 14, 2013. As opposed to the original Final Mix, the remake features Japanese voice acting in the Japanese release. As part of the collection, it was made available outside of Japan for the first time. It was later released on PlayStation 4 as part of Kingdom Hearts HD 1.5 + 2.5 ReMIX. Depending on what store the game was pre-ordered, customers could get a CD containing tracks from the game or a playing card set adorned with Kingdom Hearts characters and symbols. Also, at some stores in Japan, they were giving away a dual Keyblade embroidered necklace with a reserved copy. Kingdom Hearts Final Mix Platinum Limited came in a box containing the game case, a sheet of eight Kingdom Hearts stickers; a postcard calendar featuring Tetsuya Nomura artwork and—contained in a CD case—a block figure of Sora, part of Square's Minimum Collection; and three can badges. The set costs 8,800 yen. Sora's artwork on the start screen. Kingdom Hearts Final Mix features changes from the original version, including bosses present in the English version, but not in the original Japanese version. Other changes include recoloring Heartless and introducing new Heartless, new weapons, new abilities, new cutscenes, Gummi Ship missions, new Ansem's Reports, and a new secret movie. 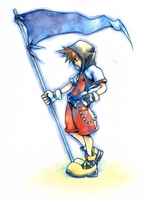 The start screen was replaced with another drawing of Sora, hooded and holding a flag. On the start screen, a trailer for Final Fantasy X-2 is accessible, labeled as a "Special Movie" as a third option after "New Game" and "Load Game". The game has three difficulty levels, the first being "Final Mix: Beginner". "Final Mix: Beginner" gives Sora a Ribbon, an EXP Necklace, Power Up x8, Defense Up x8 and AP Up x4 at the start, and neither of the secret movies can be seen. The Drill Gummi's Attack Power is 9,999, instead of 35. The second difficulty is simply "Final Mix", analogous to Standard from the previous game, but not exactly the same. The Gummi Ship takes double the damage from the original version and damage inflicted by Sora is cut by a third. The last option is "Final Mix: Proud", a greater challenge than Expert from the original game. The Gummi Ship's attack is reduced further to a half, and damage is four times. Upon finishing the game, a "Battle Report" is shown, providing the player with various statistics of the playthrough. Quality-of-life changes include the Event Skip option, allowing the player to skip cutscenes already seen. Sora becomes transparent when he appears too close to the camera. The player is also given full control of the camera to move in any direction, while in the original, the camera could only be moved laterally with the triggers. An issue involving a red Trinity located in Oogie's Manor was fixed. In the original game, if the player did not activate the Trinity prior to defeating Oogie Boogie, the trinity would disappear. The Trinity was moved to an area below an arch near the manor. Sora battling Xemnas in Final Mix. The new bosses included "Unknown", who was introduced with no context and later revealed to be Xemnas, leader of Organization XIII in Kingdom Hearts II. Also added were "palette swap" bosses for the Olympus Coliseum: Destroyed Behemoth, Arch Behemoth, Red Armor, and Sneak Army. New to the Japanese were bosses included in the English version: Sephiroth, Ice Titan, and Kurt Zisa. Two new weapons were added for each main character. These serve as "secondary ultimates", with one having more power than the regular ultimate weapon (Ultima Weapon, Save the King, and Save the Queen) usually with an MP reduction, while the other has more Magic potential with low physical capabilities. Sora's Keyblades: One-Winged Angel and Diamond Dust. Donald's Staves: Meteor Strike and Fantasista. Goofy's Shields: Mighty Shield and Seven Elements. Several new cutscenes were added. However, no new audio was recorded, and the two cutscenes involving Riku were done in a subtitled format only. At the beginning of the second day on Destiny Islands, Kairi is shown crafting her Wayfinder out of Thalassa shells. After Sora's fight against Leon in Traverse Town, Riku is shown to be lost in Hollow Bastion, calling out for his friends as Maleficent looks on. After Sora speaks to Kairi in the underground waterway in Traverse Town, Riku is shown lost in the Realm of Darkness after Ansem, Seeker of Darkness took his body. There, he is assisted by King Mickey who reveals that he has the realm's Keyblade. After Sora defeats Sephiroth, Cloud is seen walking in and beginning a duel against the one-winged angel. Prior to the Door to Darkness closing, Sora and Riku are shown playing in a flashback to their childhood. Prior to fighting the Unknown, he is shown walking into the room and speaking to Sora cryptically and non-vocally. Sora's and Goofy's responses in this scene are recycled lines from Donald and Goofy's talk with Aerith and Sora's talk with Leon and Yuffie during their original encounter in Traverse Town. This page was last edited on 18 April 2019, at 16:19.